The purpose of this blog post is to define the main technical implementation requirements needed for a customer installation running Microsoft Dynamics AX with the WMSI/WMSII (configuration key WMSBasic/WMSAdvanced) functionality, wanting to migrate to the new warehouse management functionality released as part of the Microsoft Dynamics AX 2012 R3, WHS (configuration key WHSandTMS). The blog post will not address the functional requirements during this migration, but focus on the processes needed to migrate the data.As part of this migration, it is important to understand that we recommend that you don’t run WMSII and WHS on the same partition within the same installation instance. Therefore, both a migration of data as well as the warehouse management enabling processes must be executed. It is strongly recommended that you execute the migration on top of an already upgraded Microsoft Dynamics AX 2012 R3. In other words, you would upgrade the existing implementation, for example AX2009 to AX2012 R3 CU9 (the latest cumulative update as of this writing) and then use the processes in this blog post to migrate the AX2012 R3 WMSI/WMSII to the new warehouse management capabilities in R3. Information about the new warehouse management and transportation management modules can be found under the ‘What’s new in Dynamics AX 2012 R3’ links section. One of the needed migration tasks is to upgrade the current data from the WMSI/WMSII database structure to the new WHS database structure. Migrate data supported out of the box with as minimal scripting as possible. Migrate data based on script recommendations and keeping transactional data as is. But, to start with, the following section will describe some of the key entities in both warehouse management solutions to give some background about the data migration tasks that are needed. 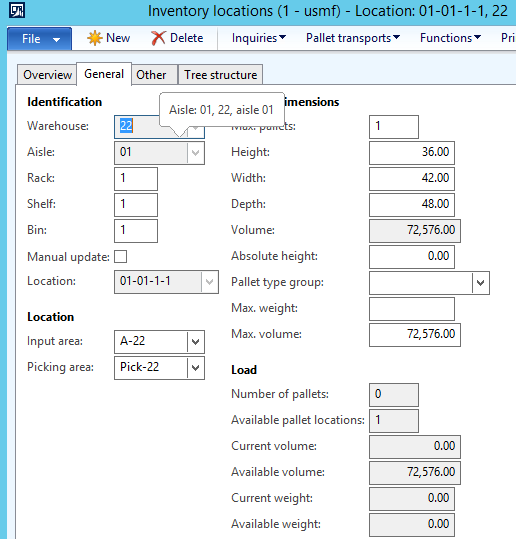 An important change made between the WMSII and the WHS data models is a new warehouse layout. The following overview can be used to get an understanding of the differences between the two database models. 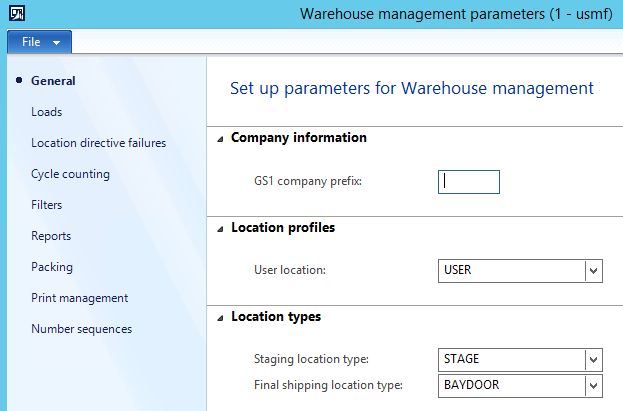 Both the ‘Warehouse’ and the ‘Inventory location’ entities are the same for both WMSI/WMSII and WHS. It is though important to understand that the use of these entities is different in the two systems. To enable a new warehouse layout for WHS processes the ‘Use warehouse management processes’ parameter must be checked on the ‘Warehouse’ form. Updating an existing warehouse to become active for the WHS processes is not supported out of the box. This setting can only be enabled when creating a new warehouse entity, making it necessary to execute custom code or manually update the data if an existing warehouse ID must be reused within the new warehouse management module. The StoreZone entity is part of the WMSII, and can’t co-exist with the WHS processes. A migration option could be to migrate the WMSII Store Zone one to one with the WHS Zone Group and the WMSII Store area one to one with the WHS Zone. But it might also be that the whole warehouse layout needs to be revised. In WMSI, the aisle, rack, shelf, and bin position define the inventory location and the physical dimensions and capacities are defined directly on the location. In WHS this is different and more details will follow about how to migrate capacity constraints. The location is defined with a user defined type (Location type) which can be mapped to the fixed AX location type. As part of the definition of the location entity, the location type (bulk, picking, etc.) holds a fixed coding concept in WMSI. In WHS, this does not drive any business logic – but is controlled by different queries as part of the module. 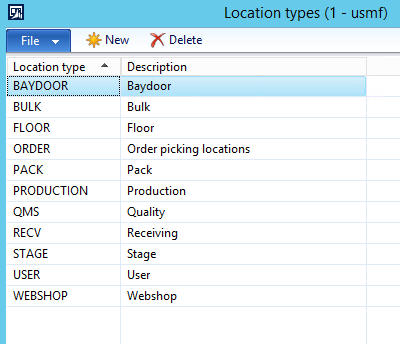 The existing WMSII location type, based on the WMSLocationType enum, can as well be migrated one to one with the WHS location type. But please do note the conceptual difference in the two implementations. In the WHS the location type entity does not in itself drive any warehouse management processes, this must be enabled by setup and query logic, so again it will make sense to evaluate if all the location types will be needed in the new WHS implementation. Make sure to add the location types for ‘Staging location type’ and ‘Final shipping location type’ as part of the ‘Warehouse management parameters’ as well. This will be needed to drive the WHS processes. The location names used in the WMSII are primarily used for the location wizard. The same conceptual design goes for the user defined location formats in the WHS. At least one location format is required. Depending on whether the WHS location wizard will be used or not to create new location entities, the Location formats can be migrated by simply only creating a single ’default’ entity. Otherwise, a one to one migration might make sense for each of the existing location name definitions. As part of the Inventory location entity, WMSI/WMSII holds values for the physical dimensions, as well as capacity restrictions. 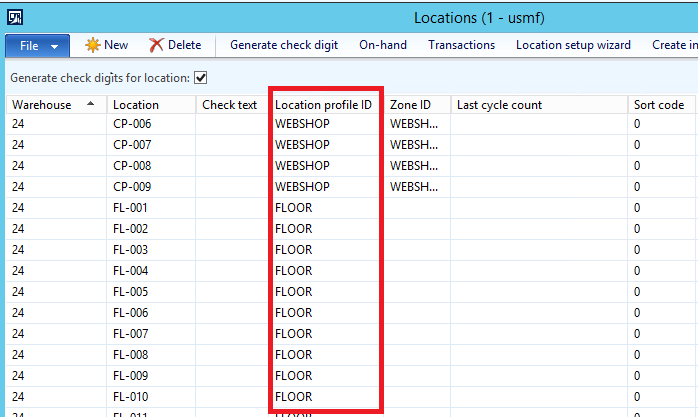 In WHS a new entity called ‘Location profile’ stores the physical dimensions and capacity of the locations. This entity will then be assigned to one or more locations. Use license plate tracking: Yes (WMSII) In case pallets are, or have been, used on a location within the warehouse, the location needs to be license plate controlled. It will not be allowed to have a mixed mode of locations both with and without license plates with on-hand. If volume is set, it is recommended to use the “Use location volume” functionality as part of the Location profiles. The actual values (height, width, depth) and maximum weight from the locations can be migrated directly to Location profiles (with one unique Location profile per combination of all the needed existing setup combinations). Besides the Location profiles a new entity called Location stocking limits has been introduced in the WHS implementation. 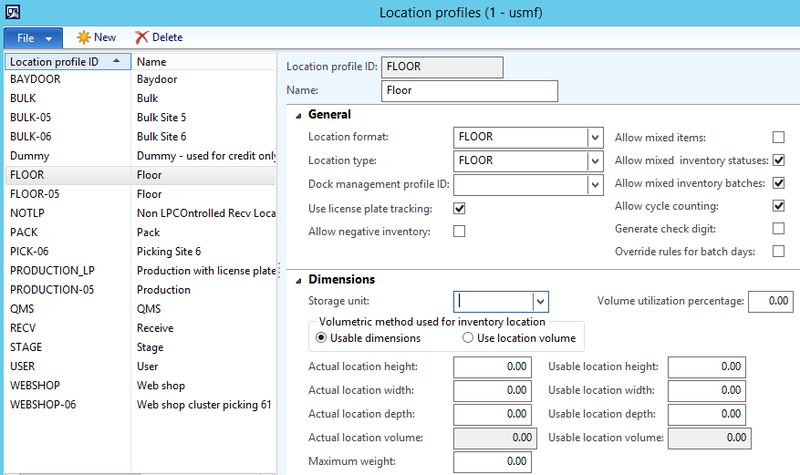 The Location stocking limits entity can be used to limit the storage capacity within the warehouse in multiple ways and levels. If an existing WMSII implementation exists with the use of ‘Max. pallets’ for one or more locations, the Location stocking limits can be used to migrate this setup by, for example, limiting the capacity of possible quantities of ‘Pallet unit’ to be stored. Please do note that the Location profile ID can also be used as part of this setup to limit the number of records to define. 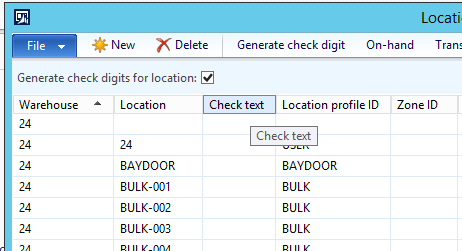 To enable location stocking limits, you might also need to use the WHS Unit sequence group ID, as well as unit conversions. The validation of the released product can be used to ensure this is correct. If check text is used, it can be migrated as well. As part of enabling the WHS processes a ‘Storage dimension group’ record must be created with the parameter ‘Use warehouse management processes’ checked. This will enforce the use of Site, Warehouse, Inventory status, Location, and License plate as ‘Active’ and ‘Physical inventory’ tracked inventory dimensions. For a ‘Storage dimension group’ with the parameter ‘Use warehouse management processes’ checked, the Location inventory dimension must have both ‘Blank receipt allowed’ and ‘Blank issue allowed’ unchecked. The ‘License plate’ must have ‘Blank receipt allowed’ and ‘Blank issue allowed’ checked. All ‘Released products’ associated to a ‘Storage dimension group’ with an active ‘Pallet ID’ inventory dimension would need to use a WHS enabled ‘Storage dimension group’ or be changed to another ‘Storage dimension group’ without the ‘Pallet ID’ active. The reason for this is that the configuration key associated with this inventory dimension is a child of the WMSII configuration key, and running WMSII and WHS on the same partition is not recommended. ‘Released products’ which are assigned to a ‘Storage dimension group’ with an active ‘Location’ dimension and using consolidated picking output orders, or other capabilities from the WMSII will also need to be associated with a new WHS enabled ‘Storage dimension group’. Please do note – that if Released products are using other WMSII processes, e.g. random storage put-away based on item arrival journal postings and input pallet transports – you also need to think about migrating these processes to WHS. If the Storage dimension group is associated on the shared product entity the current design is that this setting is inherited to all products released to legal entities. If you assign a ‘Storage dimension group’ with the ‘Use warehouse management processes’ parameter enabled, you need to consider the use of the ‘Reservation hierarchy’ for the product. Please refer to linked information about this topic. In addition to the new storage dimension group, there’s a new inventory dimension called ‘License plate’ and related new entity with the same name. The WMSII ‘Pallet ID’ should be replaced with this new WHS ‘License plate’. We recommend that you copy existing pallet entities to the new license plate entities and update the affected InventDim records. The process is described in more detail later in this blog post. Besides the new ‘License plate’ inventory dimension, a new ‘Inventory status’ dimension is introduced. It is recommended that you use a default value and that at update, you assign all the current on-hand inventory that’s being enabled for WHS. The process is described in more detail later in the blog post. The next section of the blog post will go into more details about this. The following is a description of a process that will enable migration of an existing WMSI/WMSII implementation in Microsoft Dynamics AX 2012 R3 to a new warehouse management implementation (WHS), based on using as many out of the box processes as possible. To get the most value out of this information it is a good idea to have looked into some of the existing information related to the WHS functionality and to have viewed the recording and Power Point deck from the Microsoft Dynamics Technical Conference 2015 event where a session about this migration process was held. The process will not describe the migration of the warehouse layout, but focus on the product and on-hand migration. Please do make sure the locations where license plates exist get enabled to track license plates via the location profile grouping and vice versa. The following information is a description of a process that will enable migration of an existing WMSI/WMSII implementation in Microsoft Dynamics AX 2012 R3 to a new warehouse management implementation (WHS), without reverting all open orders. To get the most value out of this information it is a good idea to have looked into some existing information related to the WHS functionality as well as the migration process described above about using as much as possible of the out of the box functionality. It is clear that when you migrate with open on-hand inventory (reserved ordered or even physically reserved) it will become more technically challenging to migrate the data. If on-hand reservations exist, they must be ‘moved’ to new reservation logic during the data migration. 1. Update all InventDim records that require the new inventory status value (default inventory status value is recommended). a. It is also recommended that you limit the number of InventDim records that get updated to only the ones used for inventory transactions for the products that are going to be migrated. This will lower the risk of updating too much. Make sure you make a proper analysis about which records to update. c. Make sure you do NOT to break the rules when assigning new Storage and tracking dimension groups as part of the script. The groups MUST use the same physical and financial settings and you need to pay attention to the ‘Allow blank issue’ and ‘Allow blank receipt’ settings. 4. Recalculate on-hand using the On-hand consistency check. This step automatically updates the WHSInventReserve table. If you’re not doing your migration on the AX2012 CU9 version, you need to install additional hotfixes. a. If open source document lines (e.g. sales and production) exist with the location dimensions assigned, these must be removed – as well on the related transactions. Otherwise, it will not be possible to process the outbound process by using WHS work. If the pallet dimension is used on the source document lines this must be handled as well. If not, the legacy outbound processes must be used without the creation of WHS work. c. All the physical warehouse layouts and processes must be enabled in the new WHS module.